Summer has officially begun and there’s no better time than now to get outside and enjoy the beautiful sunny weather. Here in Boulder, Colorado there are an endless number of trails to explore and the only real problem is deciding which one to take! Not everyone loves to hike, but I think it’s true that most all of us are more active in the summertime and generally look to spend more time outdoors. Eating well away from home is getting easier and easier as plant-based diets get more mainstream attention, but sometimes it still pays off to bring a little snack from home that can hold you over while away. A few pieces of fruit packed away in your bag are great, but sometimes you need something a little more substantial to help you make those extra miles or keep up with the kids. When digging around on the internet for something healthy and super-energizing, I came across a recipe from One Ingredient Chef that I thought filled the part perfectly. Andrew’s super-easy energy bar recipe takes just minutes to prepare, stores well in the refrigerator, and can be eaten on-the-go. I think these bars would make a great snack before hopping in the car for an outing, or packed away for when you need a second wind. And there is no doubt that just one of these bars will keep you energized for hours! The matcha powder is stimulating enough to keep you blazing down the trail, but when combined with the dates (a bit of sugar) and the cacao powder (a bit of theobromine), you’ve got a powerful, synergistic combo that will leave you feeling like you could conquer mountains! Matcha has well-known antioxidant properties and the cacao is chock-full of magnesium, which is perfect for strenuous, high-activity days. 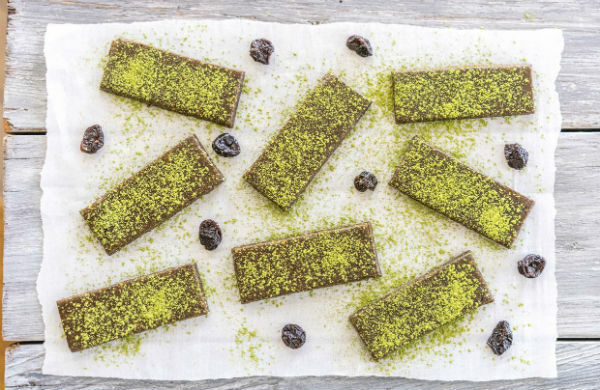 I really hope you enjoy our Matcha Energy Bars recipe, excerpted from the One Ingredient Chef and perfect for anyone who wants a high-energy, easy-to-digest snack that’s going to keep you buzzing all day long. As far as preparation goes, this recipe is as easy as it gets. You can have a bag full of bars and be out the door in around 30 minutes and still have leftovers. Just throw everything together in a food processor or high-speed blender, process for a few minutes, and it’s practically done! Feel free to adjust the amount of cacao and matcha powder if you want to play around with effects. 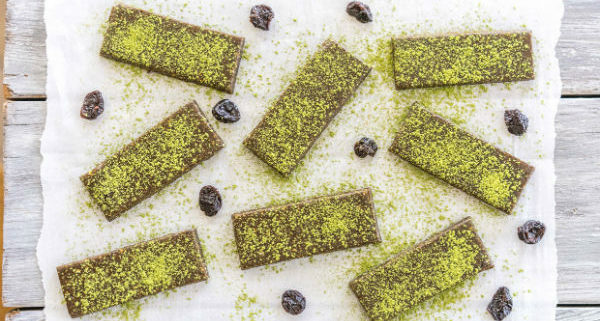 Note that matcha powder contains caffeine and cacao powder contains theobromine. Both are stimulating and eating one of these will feel like drinking a cup of coffee. I hope you all will take full advantage of the early summer season. I’ll see you out on the trail! Thanks to Creative Commons and Andrew Olsen of One Ingredient Chef for sharing this recipe. Combine all the ingredients in your food processor and let it run for at least two minutes. When it's done, the mixture should form one solid, sticky clump. Take two pieces of parchment paper or plastic wrap and sandwich the mixture between them. Use something big and flat like a cutting board to press down evenly until the mixture is about 1/4-inch thick. 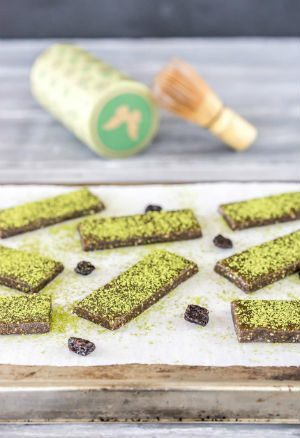 Keep the layers of parchment intact and transfer everything to the refrigerator for 15-30 minutes to firm up before slicing and using a sifter to dust the tops with extra matcha powder. If you ever want to take a deep dive into the weirdness that is the human mind, there is a surefire way: try to get healthy or lose weight. Last week, I shared the story of one gnarly craving that I struggled with for months! I then asked what kind of cravings you struggle with. I received some fantastic responses (thank you!) and want to share a few with you. My biggest problem is staying away from chocolate. ..sweets…never had a sweet tooth until going plant based 2 yrs ago…can’t lose weight but got off blood pressure meds etc…originally lost 50 gained 20 back and struggle daily. – Kathy F.
I think my biggest problem with food and alcohol is that I use it as a stress relief from our busy sometimes overwhelming lives & am constantly working on the principle of starting again on Monday! – Jane E.
Many of you confirmed when I myself have found to be true — that even when we are painfully aware of what throws us off track, we still seem powerless to stop it. When my craving hit, I knew that it was only a matter of time before I found myself in the checkout line at the local health food store, ready to tear the tops off the miracle tart container(s) and dig in. It is so frustratingly painful to experience the sense of helplessness, the lack of control, the guilt and shame of being at the mercy of a chocolate bar. Especially when we truly, truly want to get healthy, lose weight, address a medical condition, etc, and we know that we are setting ourselves back. The cycle is brutal, but the absolute worst part? The experience of failure, overall sense of guilt, not feeling good enough, and the negative self-talk that accompanies it. It’s honestly nothing short of internal psychological warfare. Well today I have a different message for you. It’s not you. You are not a failure. You don’t struggle because you aren’t good enough. There is no inherent flaw, nothing missing in you that others have. These feelings of guilt, shame, remorse, repression, deprivation, and so on do not support your journey, and it’s time to banish these feelings for good! You, my friend, are not broken. You are, however, quite human. And since you are proud owner of a human brain (whether you like it or not) with all its quirks and idiosyncrasies, it pays to revisit the instruction manual. Let’s take a step back and look at some super interesting psychological findings that might help us better understand just what exactly is going on between our earlobes. I love this, because rather than blaming ourselves, we can better understand the mechanisms at play and how to tame them, knowing that it isn’t our fault. Ready to end the psychological warfare and get the upper hand on our cravings? 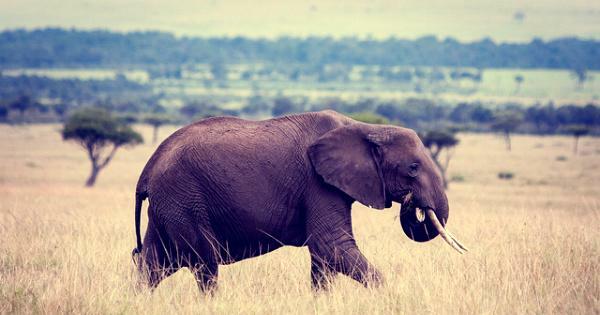 Step one in understanding cravings is acknowledging the elephant. On my About Page I share this quote from my friend Stephen in the midst of a cleanse. Please excuse his language. …hits snooze fourteen times instead of getting up to go to the gym? …justifies eating another slice of that double chocolate ganache pie “just this once” while committing to do better tomorrow? If this stuff wasn’t so painful, it would be hilarious. How very weird are we? I sometimes call this split personality syndrome the “Evil Twin.” Author and psychologist Jonathan Haidt calls it something different. In his book The Happiness Hypothesis, Haidt uses the metaphor of the Elephant and the Rider to explain this divisive aspect of our psychology. The Rider is analytical, rational, deliberates and makes decisions about the future. It is the Rider who thinks a 30-day juice fast will be great for our health and 5 am is a wonderful time for a mild thirteen mile jog. *Please note, that I’m not speaking about the nature, character, or intelligence of elephants here. As a kind reader pointed out, they are magnificent beings, affectionate and incredible parents to their young. I agree wholeheartedly, and the elephant analogy is used solely so that we can better understand our inner-pscyhology for the purpose of improving. I think elephants are awesome! The Rider sets the alarm for the 5am run, and the Elephant turns it off, sleeps until 10am, and then eats a pint of ice cream for breakfast. If you ever feel like you are two people, this is why. The key to cravings begins with understanding that you’ve got an emotional elephant to tame, and it is a powerful beast! But there are ways to rein in the elephant. Yes it’s big and cumbersome, but not the sharpest pencil in the box. Turns out that you can trick it. When we struggle with cravings, we almost always think that willpower is the answer. When the post-indulgence dust has settled, we are often embarrassed and feel guilty and ashamed. And so we resolve to try harder next time, thinking that we just need to be more disciplined. But may I remind you that you’ve got an emotional freakin elephant that you are trying to reign in! If you and an elephant go head to head, who do you think is going to win out? See, willpower is the amount of energy that we can devote to controlling our elephant. You can only fight the elephant for so long before you reach the point of exhaustion and the elephant gets its way and takes you on a wild ride. And it seems the ride only gets wilder the longer we hold out! Willpower is limited. And not only is it limited, but every single decision and act of self-control depletes our precious reserves. For example in a study cited by the American Psychological Association, researchers placed a plate of cookies and a bowl of radishes in front of students before asking them to solve an impossible puzzle. Some students were asked to help themselves to the radishes, but to please leave the cookies for another group that was coming in. Other students were given leave to help themselves to the cookies if they wished. The students that resisted the cookies struggled with the impossible puzzle for just 8 minutes before giving up. The students who ate the cookies on the other hand worked tirelessly for an average of 19 minutes before calling it quits. Every decision from what to wear for the day, to prioritizing work and projects and saying no to temptation all deplete our willpower reserve. 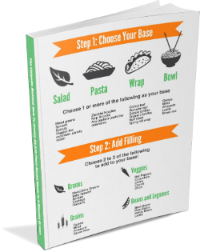 In the book Mindless Eating, author Brian Wansink reveals that the average person makes 200 food related decisions a day! And that’s just food! Now, this doesn’t take you off the hook for personal responsibility. Just like a muscle, willpower is something that you can and should build. But what we need to understand is that the Rider has a limited reserve of willpower to devote to controlling the Elephant. And when Rider and Elephant go head to head, it might not be the wisest decision to bet the farm on the Rider. Willpower is important to develop, but it is also fickle and unreliable. And there is a much better strategy to use in controlling our cravings. If willpower is not the answer, what is? What is the best way to tame the beast? To give our inner-elephant some self-restraint? In his book the Power of Habit, Charles Duhigg explains how we can harness the science of habits to use our Elephant’s might to take us where we want to go. The cue is what triggers the craving. For me, the cue was feeling a bit sluggish after lunch, and not being excited about heading back to the office. When I asked you how you felt as the craving hit, you were identifying your own cue. For many it was boredom, feeling tired and sluggish, or having an emotional day. The above examples are cues that then kick off the behavior, which in our case is indulging in the craving. My routine was driving down to the local health food store and chowing down on a couple miracle tarts! The reward is how we feel afterwards. My reward was a bit of a sugar and caffeine rush from the chocolate, and experiencing a pleasurable break from the drudgery of a long hard day at work. Now that we understand the component parts, let’s put the pieces together. Here is my own example below. Reward: Short term energy from sugar and caffeine rush and a pleasurable break before going back to work. So now that we’ve got our craving charted, we are ready to reveal the real key to changing our habits and therefore controlling our cravings. As we’ve all learned the hard way, totally eliminating a bad habit is extremely difficult. And this is exactly what most of us try and do when we decide we just need to be more disciplined. But if the Elephant is used to a post-lunch miracle tart bonanza, it’s going to get upset if lunch comes and goes with no special treat! It makes sense after all, because habits form actual neural patterns in the brain. The behavior almost becomes hard wired. So instead of quitting a craving cold turkey, the golden rule of habit change is as follows. Change the behavior or routine. Our triggers often come from the external environment, and we often don’t have much control over them. There wasn’t much that I could do to prevent the post lunch sluggishness that I was experiencing. And we have trained ourselves to expect the reward. The fix is what would have me driving to the grocery store against my own best interests! And so it is in the behavior or routine where we have the most power to affect change. When I experience my cravings trigger, what constructive activity or food choice could I make to give myself the same reward? This requires some real introspection and likely some trial and error as well. Our first guess at the reward might not be totally accurate, and it may take some digging to get to the real root of what we are seeking. In my case, I made a list of possible activities that would give me the reward I was seeking — a little post-lunch energy burst and pleasurable break from the stresses of work. And when the post lunch craving hit, I started experimenting with some of these alternatives. Voila! It turned out that a walk or some yoga sometimes satisfied the craving, but usually the most effective bet was choosing a different sweet treat. And varying both the treat and the activity seemed to loosen the hold that the craving had on me. After a couple weeks the miracle tart craving was totally gone! Take a few minutes and chart your craving. Identify the cue, behavior, and reward. Really dig deep into the reward. Now make a list of different behaviors or alternatives that you think may give you the same reward as indulging in the craving. Don’t rule anything out just yet. Experiment with your ideas and examine the results objectively. If you are still indulging in the craving, take a step back and try and find out why. Play detective without judgement. Share your results in the comments below. I’ll read and respond to every single one. Note: The follow up article Quit Cravings: The Golden Rule of Habit Change and Understanding the Elephant can be found here. I always seem to have a least one vice that is in full swing. I live in a tiny little town in southern Arizona, population 800. There are no stoplights and just one main road through town. Amazingly, we just so happen to have a fantastic little health food store. But by virtue of just how small it is, the sweet folks that run the store become intimately familiar with all of our buying habits! 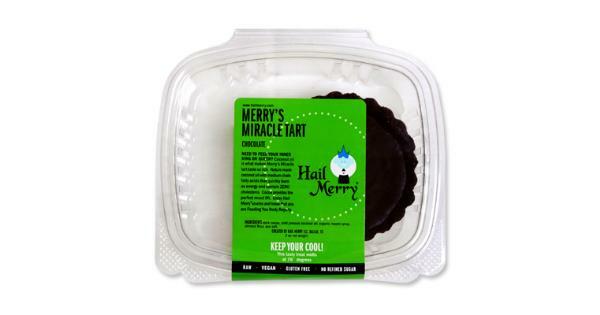 Last year, became totally addicted to these little chocolate pies called Miracle Tarts. Everyday after lunch I would find myself CRAVING them, and I knew it was only a matter of time before I found myself in the checkout line, usually with not one but two miracle tarts! It got to the point where everyone knew about my miracle tart…lets say inclination…and friends would start bringing them over when they came to visit. For my birthday, two of my friends got together and made me one enormous miracle tart pie! While this sweet treat technically met my “bottom lines” by being plant-based, no refined sugar, and no weird ingredients, it wasn’t supporting my overall goals and I had to let it go. Plus, it was getting super embarrassing! Next week I’ll share the story of how I kicked the habit. But first I want to hear from you. I don’t know anyone that doesn’t struggle with these issues of non-compliance — cravings, falling off the wagon, starting again on Monday syndrome. Leave a comment and let me know what your biggest craving is. What throws you off track? When does the craving hit? Is it a certain time of day? Is it when you feel a certain way? What’s the trigger? How do you feel before and after? Describe the emotion before you satisfy the craving and afterwards. Hint: These two questions will play a big part in figuring out how to kick unhealthy habits.